In the other type of vent, the water becomes superheated and is forced back up to the sea floor. It contains minerals dissolved from the basalt ocean plate. A vent forms when the jet of water shoots through the sea floor and its dissolved minerals begin to separateas a solid substance from a solution. The, now solid, minerals grow into a “chimney” or “smoker”. They will continue to grow while there is a supply of water from the vent. Vents have been located at depths varying from 1.5 to 4.0 kilometres. A vent will remain active for usually one or two years. Under the sea, hydrothermal vents can form features called black smokers and white smokers. The colour depends on the minerals present in the water. On land these cracks form land hot springs, fumaroles (holes in a volcanic area from which hot smoke and gases escape) and geysers. 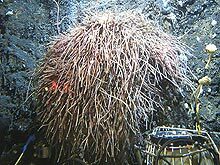 The first hydrothermal vent was discovered in 1977 by geologists on a research expedition in the Galapagos Rift off the coast of South America. 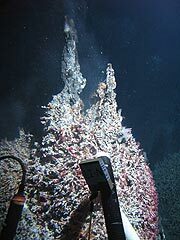 Where are hydrothermal vents found? Hydrothermal vents in the deep ocean usually form along the Mid-ocean ridges, such as the East Pacific Rise and the Mid-Atlantic Ridge. 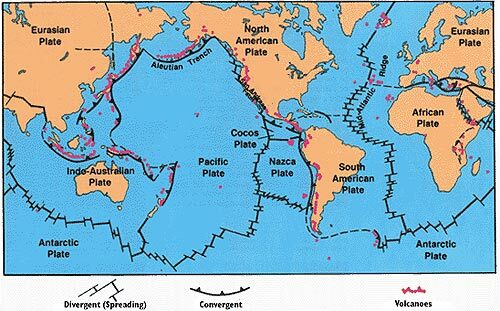 These are locations where two tectonic plates (moving sections of the Earth’s crust) are branching out and new crust is being formed. The superheated water is at temperature from 60°C up to over 450°C and because of the high pressures at depths the water has physical properties between a gas and a liquid. The water is also extremely acidic, often having a pH value under 3.0, similar to vinegar. What is the energy source for hydrothermal vent communities? Hydrothermal vent zones have a density of organisms 10,000 to 100,000 times greater than found on the surrounding sea floor. The organism on the coean floor depend on “ marine snow” which consists of small particles of organic marine sediments, including the remains of organisms, faecal matter and the shells of planktonic oganisms, that slowly drift down to the sea floor. At the depths these vents are found at there is no sunlight so no photosynthesis can occur. Instead a process called chemosynthesis takes place. Hydrogen sulfide is the primary energy source for hot vents and cold seeps. Chemosynthesis is a process special bacteria use to produce energy without using sunlight. The energy comes from the oxidization of dissolved chemicals which escape from the Earth's crust through hydrothermal vents. Oxidization is when a substance combines with oxygen to form another substance. Burning is a very common example of oxidation. In cold seeps which contain high concentrations of methane, bacteria convert the methane to sulfides then other bacteria convert the sulfides to organic materials (e.g. carbohydrates). These reactions take place at low temperatures. The carboydrates produced become the energy source for all the other organisms in a hydrotermal vent community. The bacterial mats are grazed by other microorganisms such as amphipods and copepods.These provide for a food web containing other animals including limpets, shrimp, crabs, tube worms, fish, and octopi. Other animals found in vent communities can include acorn worms, dandelion-like animals, mussels, a variety of worms, anemones and other species of shrimp and tube worms. Animals that feed directly on the bacteria - the first-order consumers, include animals like zooplankton and small crustaceans such as shrimp and amphipods, which feed directly on the vent bacteria. Second-order consumers feed on the first-order, these include smaller crabs and fish. Tertiary or top-level consumers feed on the first order carnivores and include larger crabs, octopus and fishes. Some species of crabs and fish are detritovores, feeding on dead animals and their remains, in the community. Clams and mussels, tube worms in vents have a symbiotic relationship with bacteria, that is both organisms benefit from living together. The giant tube worms have no digestive system and rely solely on the bacteria for their nutrition. The plumes at the top of the worm's body are red because they contains haemoglobin, the pigment found in humn blood. It combines with hydrogen sulfide and transports it to the bacteria living inside the worm. In return, the bacteria oxidize the hydrogen sulfide and convert carbon dioxide into carbohydrates, the energy source for the worm. The brown, spongy tissue filling the inside of a tube worm is packed with bacteria - about 10 thousand million bacteria per gram of tissue. Tube worms reproduce by spawning, releasing sperm and eggs into the water. Scientists don't know how tube worms and other organisms locate new vents for colonization as the vents are relatively small, and they are separated, like islands. Most vent organisms have a free-swimming larval stage but scientists are not sure whether the larvae float randomly or purposely follow clues - such as chemical traces in the water - to find new homes. What threats are there to hydrothermal vents? Hydrothermal vents, in some instances, have led to the formation of exploitable mineral resources via deposition of massive sulfide deposits on the seafloor seafloo, for example the Mount Isa orebody located in Queensland, Australia.. Recently, mining companies, driven by higher prices for base metals have begun to look at the extraction of mineral resources from hydrothermal fields on the seafloor. At present, costs for this are prohibitively high but significant cost reductions are may be possible. Hydrothermal vents support life; this demonstrates just how resilient life can be. There are also a surprising diversity of life forms that inhabit these vents, despite the absence of sunlight and elevated pressures and deadly heat. Bacteria found deep in the ocean in the volcanic regions of mid-ocean ridges suggest a possible scenario for the beginning of life on earth. Ocean water seeps into cracks created by sea-floor spreading at the mid-ocean ridges and is heated by magma from inside the earth. Water in these hydrothermal vents reaches temperatures of 375 degrees C and higher and is rich in dissolved minerals. The hot water rises from the vents in geysers and meets cold ocean water, causing minerals to precipitate out of solution as the water cools. In some places compounds of iron and sulfides form "chimneys" on top of the vents. Such an extreme environment seemed unlikely to support life given the conditions of temperature, pressure, and absence of light for photosynthesis. http://youtu.be/D69hGvCsWgA Hydrothermal VentsBill Nye discusses the discovery of hydrothermal vents on the ocean's floor.